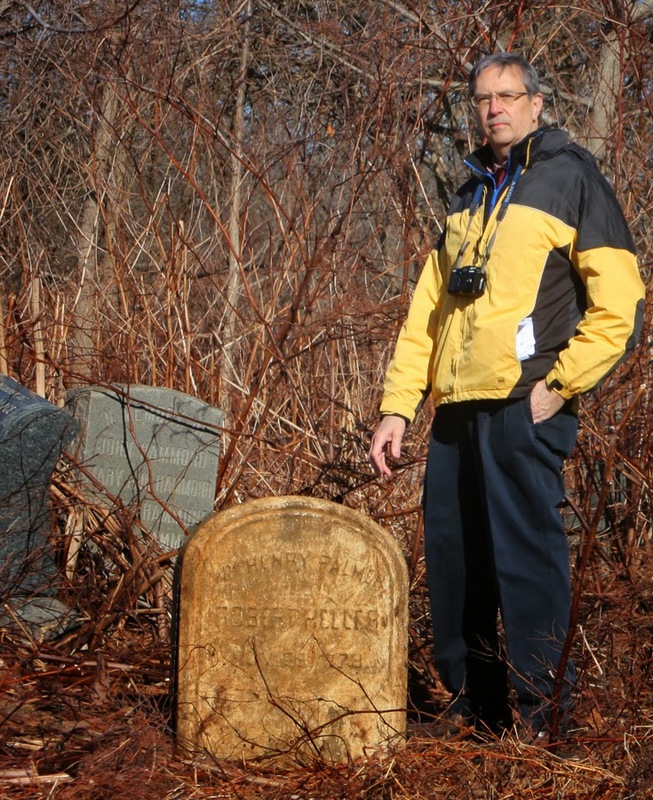 Ed Snyder began this blog in order to share his decade-long experience with all things cemeterial. As a photographer specializing in images of cemetery statuary, I've run into some interesting people, had some unexplainable experiences, and had a lot of fun. With the popularity of the current television series, Houdini (The History Channel), I thought I would mention one of Harry’s predecessors. 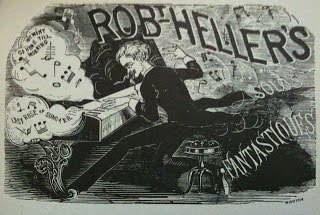 Robert Heller was a Victorian-era magician. He also happened to be an idol of Harry Houdini’s. Houdini, who reached his prime after 1900, referred to Heller as the most versatile magician who ever lived. Kristen Connolly and Adrien Brody in the “Houdini” miniseries on History. 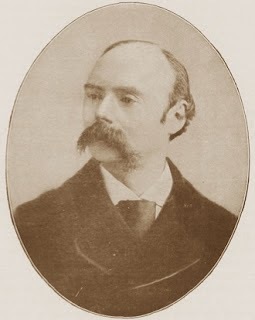 Robert Heller (1826 – 1878), whose real name was William Henry Palmer, is buried in Philadelphia’s Mount Moriah Cemetery (on the Yeadon, PA side). I visited his grave last year. Doesn’t sound like much of a feat, given the fact that I only live ten miles away! However, for many years, his headstone was missing. Not the act of a conjurer, but rather ground subsidence, or maybe vandalism. A group of magic historians had been trying to locate it for the past several years, no doubt to pay homage to the person who single-handedly popularized theatrical magic in America. 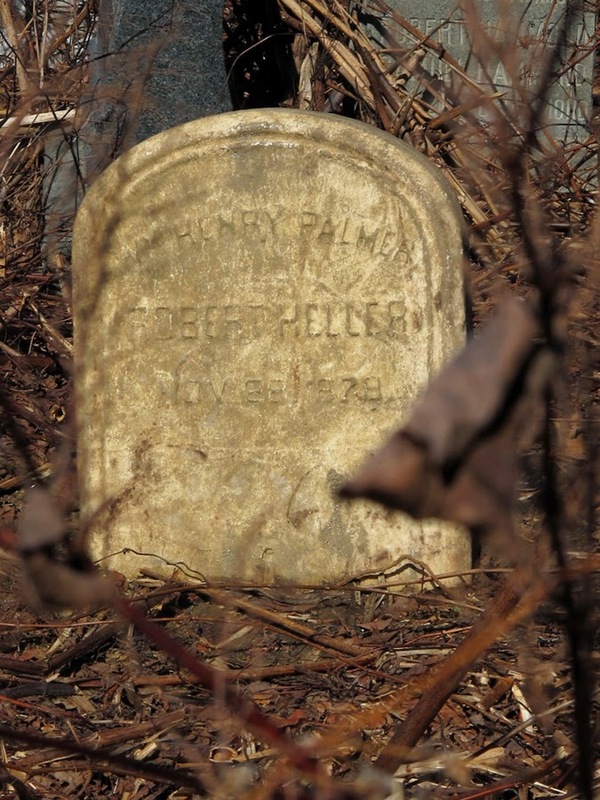 Around the time (2011) that the Friends of Mount Moriah Cemetery, Inc. (FOMMCI) began restoration efforts at this massive, formerly abandoned cemetery (the largest cemetery in all of Pennsylvania, at 380 acres), interest in Heller’s grave was renewed. 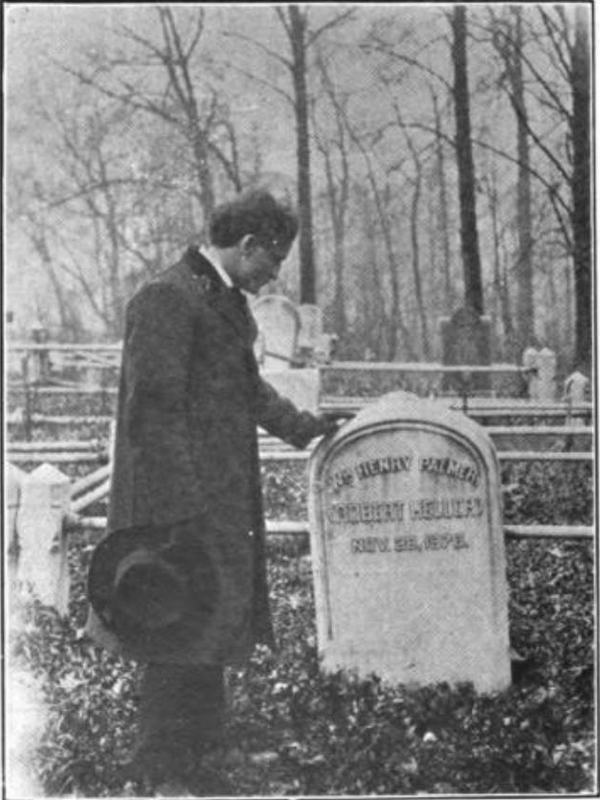 The grave had actually been lost and found and lost and found a number of times since Heller’s death in 1878. Harry Houdini himself found it around 1910 (here’s a photo of him standing next to it). After that, it disappeared (fell over and was covered with weeds) until Donna Morelli found it again over a hundred years later, in 2013. Donna (on Facebook, The Haunt of Mount Moriah) is a board member of the Friends of Mount Moriah Cemetery, Inc. After running across the photo of Houdini next to Heller's grave on the Internet, she and other volunteers located the plot through burial records and old plot maps (Section 135, Lot 189). The section of the cemetery in which Heller’s grave resides looked like this at the time (see above photo, which I borrowed from Dean Carnegie’s blog, “The Magic Detective”). 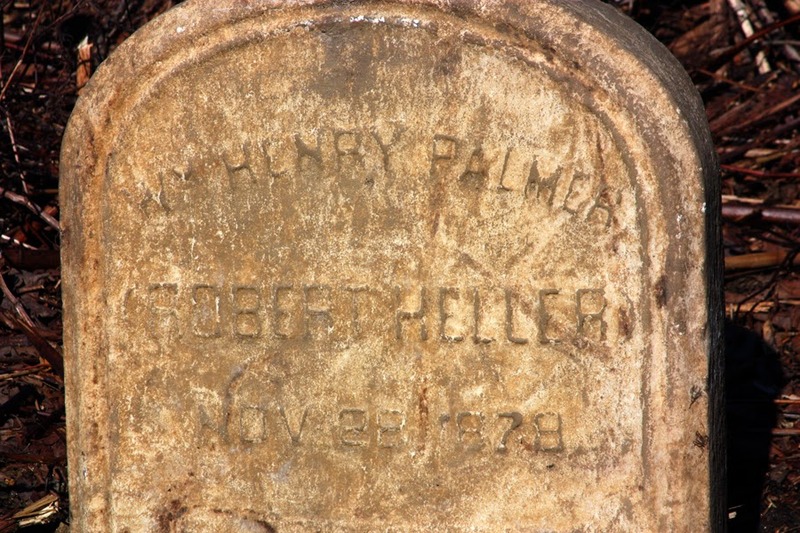 In the fall of 2013, Donna and Board Treasurer Ken Smith cut back all the weeds and trees around the grave, and raised Heller’s headstone from the earth. Section 135 is an area of the cemetery that had probably not been maintained by the previous cemetery owners since the 1960s. Now it has been cut back, cleared of weeds and is regularly mowed. (You can see the current state of each section in this landscape plot map; Section 135 is at far right, center.) In fact the FOMMCI, with its thousands of volunteers on regularly-scheduled cleanup days, are only able to keep about 25% of the 380-acre cemetery grounds maintained (this will change soon, as cemetery ownership is expected to be transferred from the defunct original association to a new corporation). A few weeks after Heller’s headstone was raised and reset, I visited the grave site. Ken Smith had conscientiously cleared a path the width of a car lane back from the main road of the cemetery to the outer reaches of the northernmost end so people could gain access to the site. Which is not to say I did not have some difficulty finding it! A plot map is wonderful (you can see them on the FOMMCI website), but it’s not very easy to get your bearings in an old overgrown cemetery. For one thing, section markers may be missing or hidden by weeds so you cannot even tell where the corner of a section is! Once you’re in a section, you need to count out the plots to get to your destination. That said, if the entire section is overgrown or grave markers are missing, the task becomes exceedingly difficult. The northern end of Mount Moriah is so overgrown currently that if not for the old roads bordering the sections, it would be impossible to guess where one section began or ended. 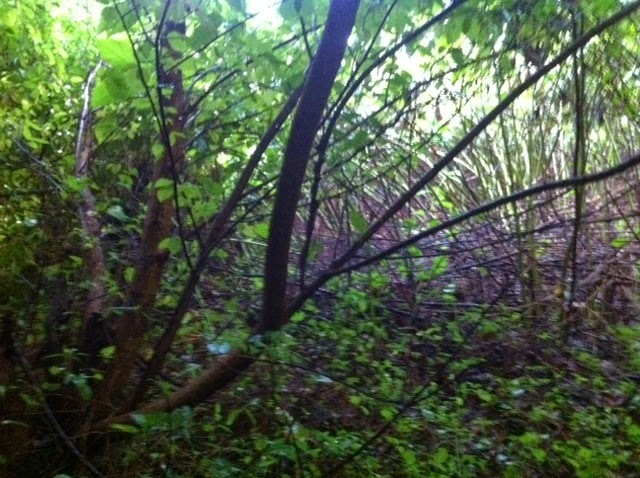 Turned out that I initially mistook Section 132 for 135 and spent an hour crashing through a dense thicket of small trees and eight-foot tall Japanese knotweed stalks looking for a headstone the shape of the one in the Houdini photo. I didn’t realize at the time that Ken had cleared a path directly to the Heller headstone – you couldn’t actually see Section 135 from 132 through the thicket. Bear in mind that I was there in the fall, when visibility through the foliage is at its best! After some persistence, however, I located Section 135. In a small cleared area of 135 bordering Section 137, I found the stone in question. It really is like finding buried treasure, when you find a grave marker that no one has seen for decades or more. When I also realized that I was standing in Harry Houdini’s footsteps, I had to set up my camera and take a picture. I must say it gave me an odd feeling, like it was standing in a sacred place. I suppose all graves are, or should be, anyway. 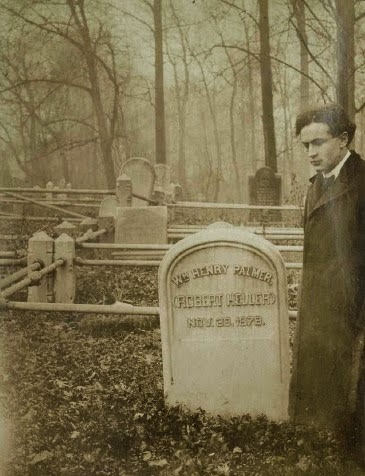 It is interesting to note that Houdini himself was dismayed at the condition of the cemetery, and especially Heller’s grave, when he visited around 1910. At that time Mount Moriah had been in existence for 55 years. Apparently, conditions were bad at that point. 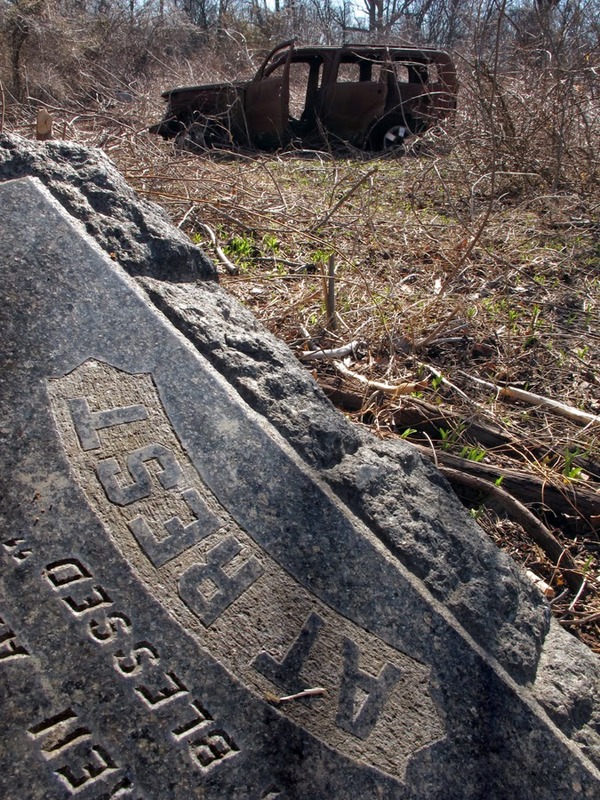 By the 1960s, cemetery conditions worsened, and reached a deplorable state in 2011 when the FOMMCI took over and began to organize massive clean ups and restoration events. 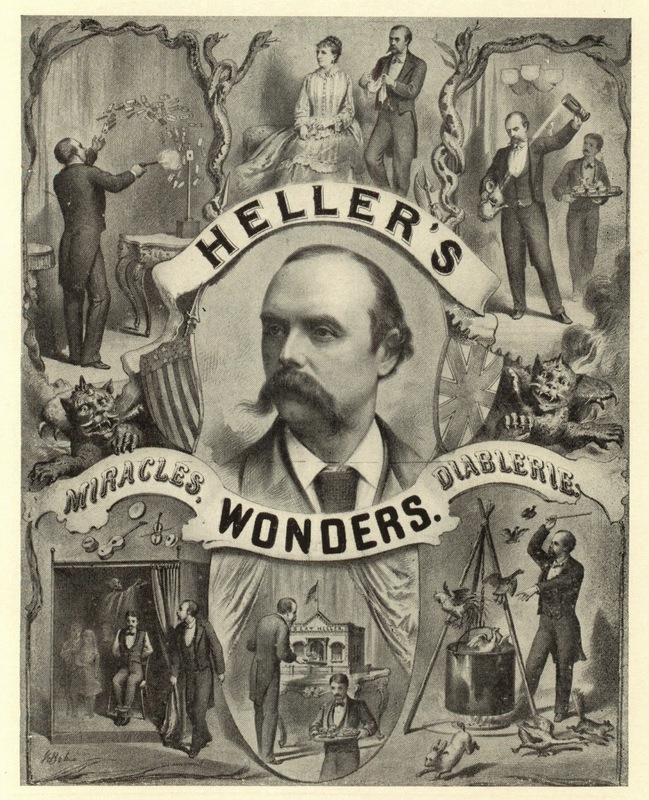 Heller moved from Britain to America in the 1860s, where he began his successful career as a magician. “At first an imitator of his more famous contemporaries,” says the Encyclopedia Britannica, “Heller eventually emerged as an entertaining and witty performer whose most famous act was a second-sight (mind-reading) presentation." 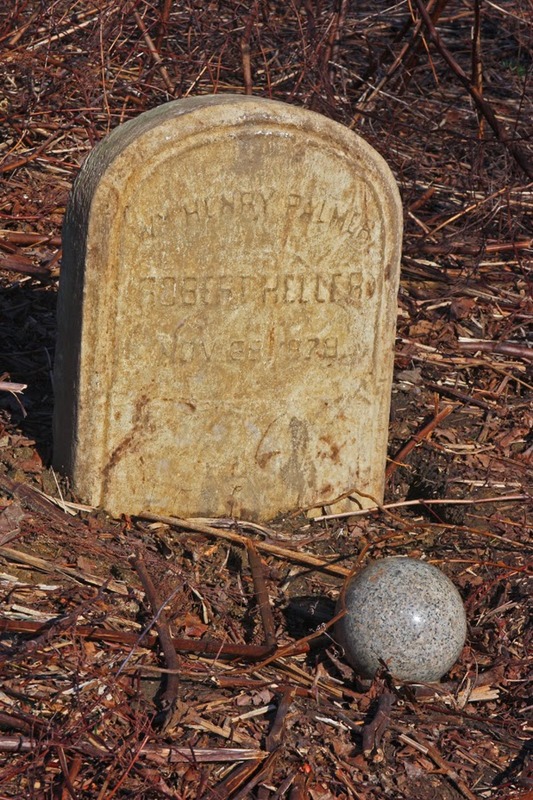 Speaking of “second sight,” when I finally located Heller’s grave, I was a bit taken aback by what appeared to be a crystal ball on the ground nearby. Upon further investigation, however, it was merely a granite decorative sphere from a neighboring plot, which had probably fallen off an old gate post. Heller’s grave site, as well as the area immediately surrounding it, is not pretty. The ornamental grave plot fencing is long gone (seen in the vintage photos of Houdini at the grave). A rusting wreck of an old truck sits nearby – the last one still to be removed from the old cemetery. Trees, vines, and knotweed grow wild outside the cleared area, headstones have fallen. While the FOMMCI and thousands of volunteers routinely perform amazing feats of magic in keeping the flora under control, there is so much more to do! The Friends of Mount Moriah Cemetery is a 501(c)3 nonprofit organization dedicated to the preservation and promotion of Mount Moriah Cemetery by honoring the memory of those interred here through community engagement, education, historic research, and restoration. For a schedule of cleanup days, click here! All are welcome to attend any cleanup event! What an interesting article! Magician's names entwined with one another, as tangled as the overgrowth at Mount Moriah. How many more notable names will be found, I wonder. One day I hope to visit this amazing place. Glad you enjoyed the article! Winter is the best time to visit. Bạn đang muốn mua các mặt hàng Trung Quốc để về Việt Nam kinh doanh. Tuy nhiên, điều khiến bạn lo ngại đó là làm thế nào để vận chuyển. Dịch vụ nhận chuyển hàng từ trung quốc .Bạn cần tìm một Công ty vận chuyển hàng hóa từ Trung Quốc về Việt Nam uy tín? Hãy vào đây để tham khảo qua về công ty của chúng tôi nhé.... van chuyen hang trung quoc gia re cùng với công ty vận chuyển hàng từ trung quốc về việt nam Là hai quốc gia có đường biên giới liền kề nhau,do đó việc thông thương, trao đổi buôn bán giữa Việt Nam và Trung Quốc vô cùng phát triển.chuyển hàng từ trung quốc về hcm Bạn đang cần tìm nơi Chuyên nhận order hàng Trung Quốc giá rẻ ở tại TPHCM. Hãy vào đây để tham khảo qua dịch vụ của chúng tôi nhé.. Ngoài ra vận chuyển hàng từ trung quốc về hà nội Những chú gấu bông xinh xắn dễ thương không chỉ là món đồ chơi ý nghĩa dành cho các bé mà còn là món quà tuyệt vời mà bạn có thể dành ...chuyên ship hàng trung quốc để có thể tha ga mua sắm. Being a 'cowboy', I thought this was the Mount Moriah Cemetery in Deadwood, SD. However, I'm not a 'magician'. Is there any other 'celebrities', interred there? Purchase Ed's "Stone Angels" Book!